Our low estimated initial investment for your first three months of operation is $23,030-$40,200 and includes our $15,000-$22,500 franchise fee. Ranked in Entrepreneur Magazine's 2009 Franchise 500, The Grout Doctor® is the most experienced, most respected and most recognized brand in the business! The Grout Doctor® renews existing grout, tile and natural stone to its original beauty. 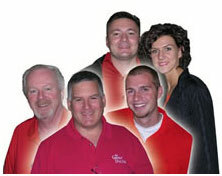 Why a Grout, Tile and Stone Care Franchise? This indicates a huge demand for the aftermarket care of tile grout. As the industry leader since 1992, The Grout Doctor® grout franchise is ideally positioned to harness this demand. The current composition of grout, tile and stone care services is a classic example of a truly fragmented industry. With typically low barriers to entry, no licensing, federal or state oversight and no other reliable brand to turn to, consumers are weary and likely to experience poor results and dissatisfaction. Savvy customers are thrilled to find highly trained Grout Doctor specialists and a recognizable brand! Why a Grout Doctor Franchise? Please note that Grout Doctor is currently not accepting leads from ND, RI, SD, VA, ID, MT, VT, WY, or from outside the US. Interested parties should have at $20K to invest. The information on this web site is not an offer to sell, or a solicitation of an offer to buy a The Grout Doctor® franchise from Grout Doctor Global Franchise Corp. An offer of a The Grout Doctor® franchise is made by means of our Franchise Disclosure Document only. The Grout Doctor® franchises are available to qualified prospective franchisees only in certain states. Click on Request Information button above for FREE information on how to start a Grout Doctor franchise today! Please Note: Grout Doctor franchises for sale, and other franchise opportunities, business opportunities, businesses and franchises for sale on this web site are not to be considered as an "offering", "franchise offering", suggestion or recommendation by GlobalBX. The franchises, businesses and business brokers seen on this web site submit their own individual content. This advertisement depends entirely on the truthfulness of the information provided by our advertisers which includes, but is not limited to, franchisers, franchises, franchise brokers, franchise consultants, business sellers and business brokers. As always, GlobalBX recommends that you consult a lawyer, financial consultant, accountant or professional advisor before buying a franchise or business opportunity or any type of business. By submitting this form and requesting more information, you have agreed to all terms and policies of GlobalBX and the business and franchise offerings listed here. Please review our Terms & Conditions for more information.